I happened to watch the Republican debate tonight. It was like getting a broken nose reset. The verdict was clear: Romney won easily, Perry lost badly. And forget about the rest, they're inconsequential. RP needed to hit this one out of the park to have even a remote chance of climbing back into the race -- not going to happen. His wife can stop bitching about the way her hubby is being treated, he's toast. Let it be said one more time that the only reason Romney has been winning these debates is because his competition is hapless and inferior. He's winning due to relative superiority. Wait until he's up against Obama, one on one. It will be a stark contrast compared to this cast of kooks and yokels. Fortunately it has thus far remained non-violent. Let's hope it remains that way and doesn't eventually attract the "wrong" people as its sphere of influence expands. Buffett takes on Murdoch -- clash of the titans! Surprise! Lobbyists "infiltrate" debt super committee. 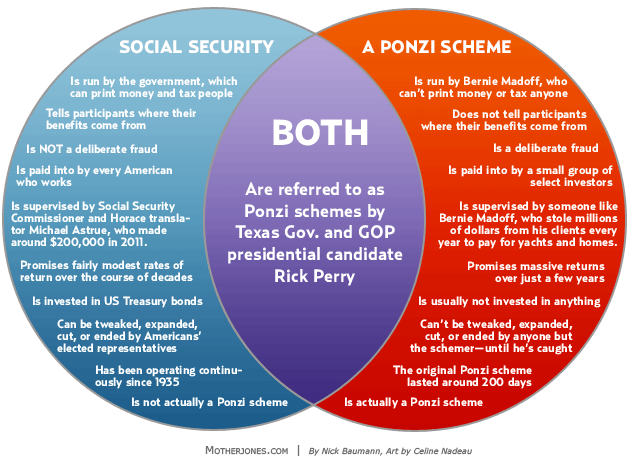 The difference between Social Security and a Ponzi scheme. Reagan increasingly looks better (more moderate) in relative terms than the GOP kooks of today (who would most likely cast him out as too liberal). As the planet warms, forests die, and as they die = less trees to absorb CO2 and pollutants, and with less trees to absorb CO2 and pollutants, planet warms even more -- repeat. Clarence Thomas must go. If he can't figure out how to complete a form, what does that say about him ruling on some of the most complex and important issues that face this nation? Remember when Mr. Tea Party, Sen. Scott Brown (R-MA), was going to shake up Washington, change how it's done down in DC....?? Yeah, right. More BS eaten up by naive supporters. "Every day, more than 100 million cubic feet of natural gas is flared this way — enough energy to heat half a million homes for a day. The flared gas also spews at least two million tons of carbon dioxide into the atmosphere every year, as much as 384,000 cars or a medium-size coal-fired power plant would emit, alarming some environmentalists." Bloomberg: continued high unemployment could lead to expanded rioting. "Congress spent over $120 billion to rebuild Iraq and Afghanistan. Tell them it’s time to rebuild America." How many investigations on Solyndra, four? And amounting to $500 million, it's the only failure of close to $40 billion invested in green energy, or about 1% of funds. What an outrage. Meanwhile, how many investigations were assigned to the $18 billion in cash missing in Iraq under GW's reign?? "Sarah Palin Says She Will Not Seek the Presidency"
"Steven P. Jobs, Co-Founder of Apple, Dies"